Miley’s out of the top 10! Miley’s out of the top 10! Miley’s out of the top 10!!! What a way 2 start the new year!!!!!!! I’m so XCITED that I can’t even complain that the only new song to enter the top 10 this week is a single that’s been around 4ever. Uh oh … I really hope Miley doesn’t come back next week. FINGERS CROSSED!!!! Eminem and Rihanna grab the top spot for the fourth week in a row, while Rihanna earns her 51st week at number 1 in total, the third most in the history of the Hot 100! Ugh, Ke$ha, your new video is soooo GROSS!! Looks like OneRepublic can count on being number 3 as they spend their fourth week in third. Lorde has a great start 2 2014 as she rises 2 number 4. Christina makes a great addition 2 any song. Just ask Lady Gaga! Imagine there’s no Miley. It’s easy ’cause she’s no longer in the top 10!!! If by “her” Passenger means Miley, than absolutely I will! 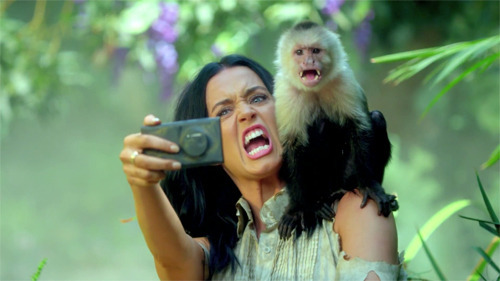 Katy ROARS back in2 the top 10. U C what I did there??? Did u guyz read Country’s article on charity? 1D is the best (well, 2nd best)! I hope I’m not dreaming Miley’s gone! Is “Wrecking Ball” gone for good or will it be back with a vengeance? Let us know in the comments below!